Mbali Ntuli is a South African politician and a Democratic Alliance Member. She currently serves as the Provincial Campaigns Director for KZN. She is the former leader of the Democratic Alliance Youth, the youth wing of South Africa’s official opposition party. She was elected to this position in May 2013. Ntuli is a product of the DA Young Leaders programme and was part of the 2008 stream. After graduating, Ntuli returned to KwaZulu-Natal, where she was elected provincial DA Youth Chairperson. In that position, she helped the DA to build up their political presence in townships such as KwaMashu and Ntuzuma. She held the office of Chairperson of the DA Youth from 2010; was elected on 18 May 2011 as a councillor for the community of Inanda in the eThekwini Municipality; and succeeded Makashule Gana as DA Youth Federal Leader in 2013. She was elected to the KwaZulu-Natal legislature after the 2014 general election. 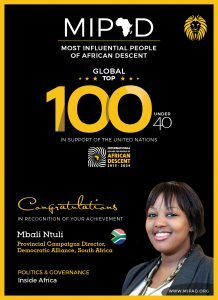 We are proud of what she has achieved and recognize her as one of the Most Influential People of African Descent Politics and Governance Category.